When the phone doesn’t ring much, in addition to the work that does come in, I have the time to return to jobs that get delayed, start long overdue projects and catch up over a longer time scale. The result is always the same in that I bite off more than I can chew and end up being swamped with tasks and crisis management has to be employed. So invariably jobs take longer from start to finish, but several end all at the same time. This Deagan Aurora is an example of one of those instruments that I keep returning to over several weeks rather than working on this vibe alone from start to finish. In 1256: Deagan Aurora (pt1) I concentrated on the damper system (mainly because I had to do exactly the same job on another instrument, so I did the two back to back. 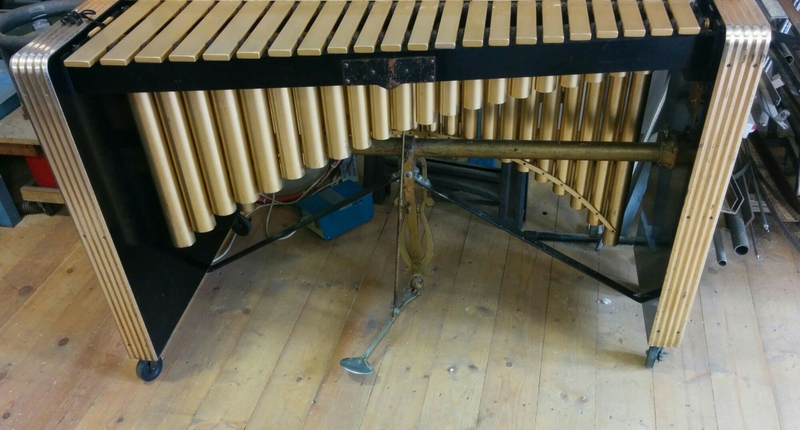 In this post I will look at the frame of the vibraphone. In the photo above, the two massive ends of the Aurora can be seen. These are held together by the central bar on which the pedal is mounted. It is quite a clever design, but in practice not that use friendly. 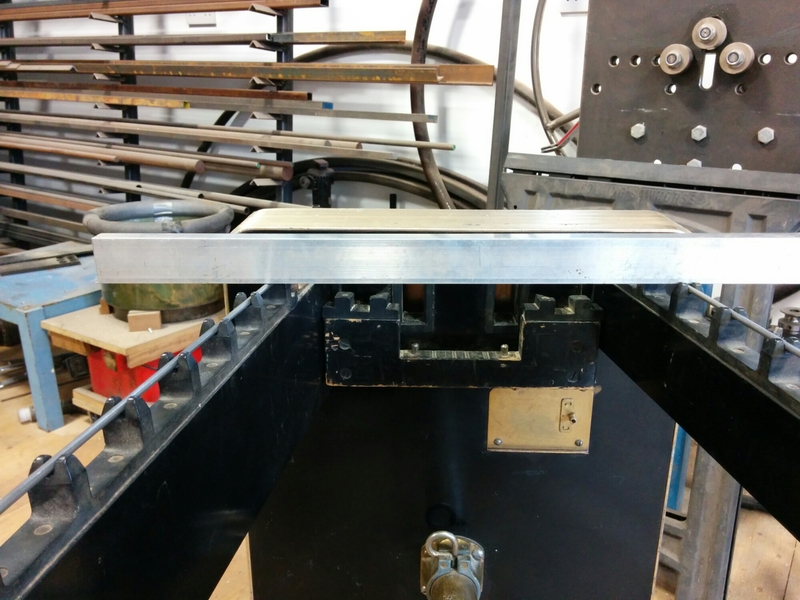 The bar slides into a telescopic socket mounted on either board. 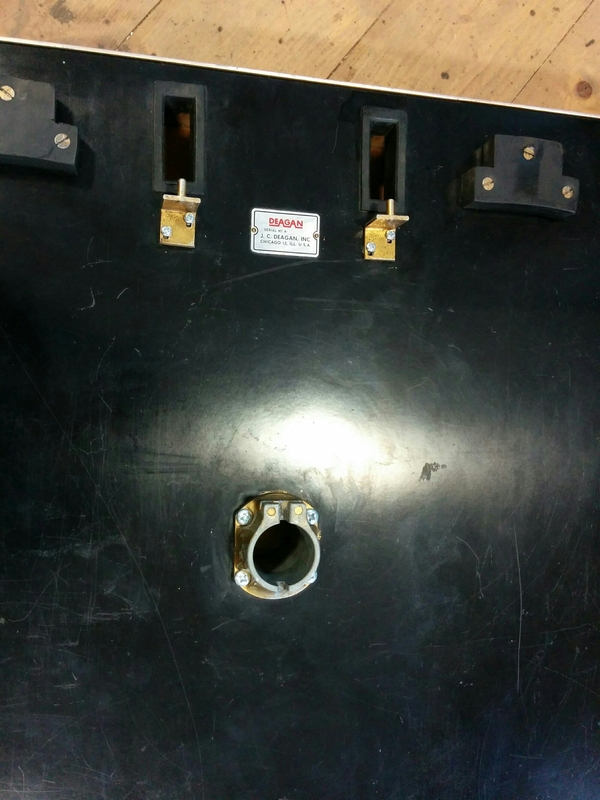 This socket goes nearly the full depth of the end board and means that the two ends are kept perpendicular to the cross bar through the 360 degrees of the tube; gravity keeps the wheels horizontal on the floor and these two ends are massively heavy. Therefore with just the two ends and the cross bar attached I can verify that the ends are perpendicular, parallel and level to each other. This provides me with a second datum line (the floor (being absolutely level) is my first datum) at the top of the vibraphone. Now I have my datum line, I have exposed a major problem – none of the note rails are level. In the photo above, the gold on the top of the end board and the silver of the aluminium straight edge should be parallel, but it can clearly be seen that the black line gets wider towards the left of the picture, which means that the outside accidental note rail is lower than the natural outside rail. At the low end of the instrument it was the other way around and obviously they were not level down their lengths. Further investigation revealed that one of the inner note rails was above the line, depicted by the straight edge, and the other below. This is a major issue especially on instruments with a damping mechanism like vibraphones; if the notes are not flat, then there is a reliance on the felt on the damper bar to accommodate these discrepancies. This only works if the correct felt is used, which it isn’t, and silly fads like using gel will definitely not work, certainly not to that standards that my customers have come to expect. Therefore I put mechanisms into the ends and centre joints of all the note rails so that I can make the necessary adjustments and set the instrument up properly. Another obvious and simple modification that I make that I have never seen on any other percussion instrument which resolves the recurring problem that these instruments are used in the real world and not just to look pretty in showrooms and catalogues. On this Deagan Aurora, the cause is because it was made badly, but in this day and age of mass production the same problem occurs through wear on substandard materials.